We call him Heath (get it, Heath Hedger). 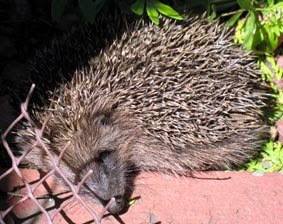 I nearly stepped on him last month as he snoozed on a wee sunny patch on the narrow path. You can see more of the wildlife in my garden on my Folia pages. A month ago I took pictures of the fast changing sky for seven minutes, these are just a few of them. It was like having a whole month of skies fly by in one ad break. Sky is all I seem to show you these days, but not being out much and not being on the internet either means sky is pretty much the best thing I see each day (not today, day 3 of grey skies and floods). You probably guessed I've not been well. It takes a lot to stop me blogging. Still not ready to do regular posts but I thought I should update a bit, it's been over 2 weeks. One great piece of news is that my neighbour has asked me to plan her garden for her. When it is done I will be able to enjoy it too so I'm choosing plants for year round interest and going for lots of scents and varied foliage. It feels great to be able to apply my mind to something creative even though I can't do the physical making. I've still not visited any of you and have taken to inventing stories in my head about what you might be doing, they are all very extravagant... I imagine Susan painting huge murals everywhere, Heather be commissioned to do pinhole wallpaper for a range of exclusive (but not pretentious) boutiques, Lisa collaborating with everyone I admire (oh wait, she's doing that already! ), Anna suddenly moving to an island off Indonesia that is threatened by rising seas (not unlikely). I've had these thoughts about all of you who I normally visit. I'm especially thinking of those of you with aches, pains and chronic illness, you know who you all are, I hope you've been having more good days than bad.